I am very pleased to have a chance to work on this set review and to give my take on this very exciting new iconic LEGO set that will definitely thrilled many of us out there. 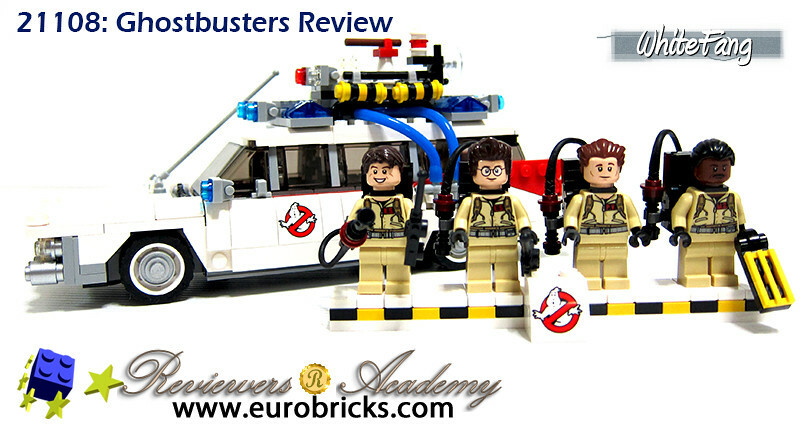 First of all, I will like to thank Eurobricks and TLG for giving me this opportunity for me to review the beloved 21108 Ghostbusters set. Of course, without the success of the past LEGO CUUSOO platform and now currently known as the LEGO IDEAS, Brent Waller has achieved the 10,000 votes on 14 August 2013 and his project had went through the panel review, ultimately achieved the actual LEGO Design and Production status. And, this is where it has lead to. Before we expand and touch onto the actual set review, let's take a moment to re-look the past successful LEGO CUUSOO Products and it has created many new exciting products. I had never bought CUUSOO Products before, except the recent 21103 The DeLorean Time Machine which is awesome treat for me since I love the Back To The Future movies very much. Without knowing it, we are actually at the 6th product launch of this cycle where there is a migration of branding platform from LEGO CUUSOO to LEGO IDEAS. 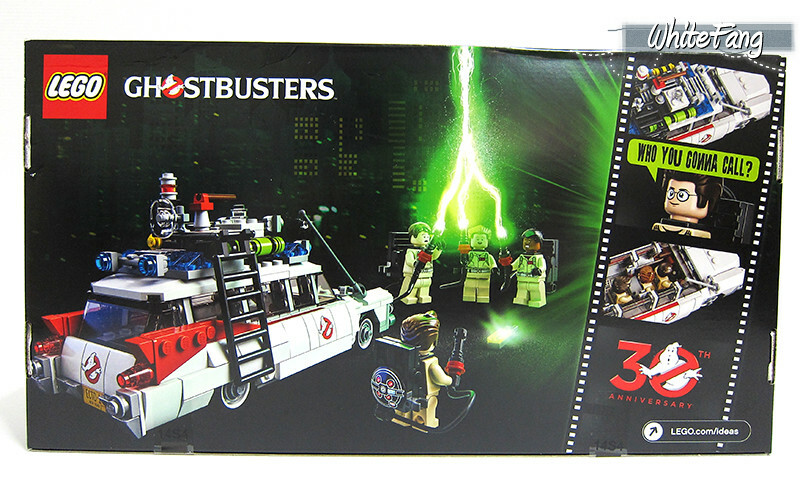 To mark the first official LEGO IDEAS product and the sixth LEGO CUUSOO product, the 21108 Ghostbusters is the selected product to mark the current transformation as indicated in the box art. So, what is this LEGO IDEAS all about? LEGO IDEAS is pretty similar like the past LEGO CUUSOO concept. To show and establish an unified brand of LEGO Product lines, LEGO IDEAS is introduced as a full pledged theme to drive the LEGO CUUSOO concept especially since LEGO CUUSOO is no longer under beta testing or a test bed to carry out new potential LEGO trials in selected market and global market by gathering votes and undergo LEGO review panel. 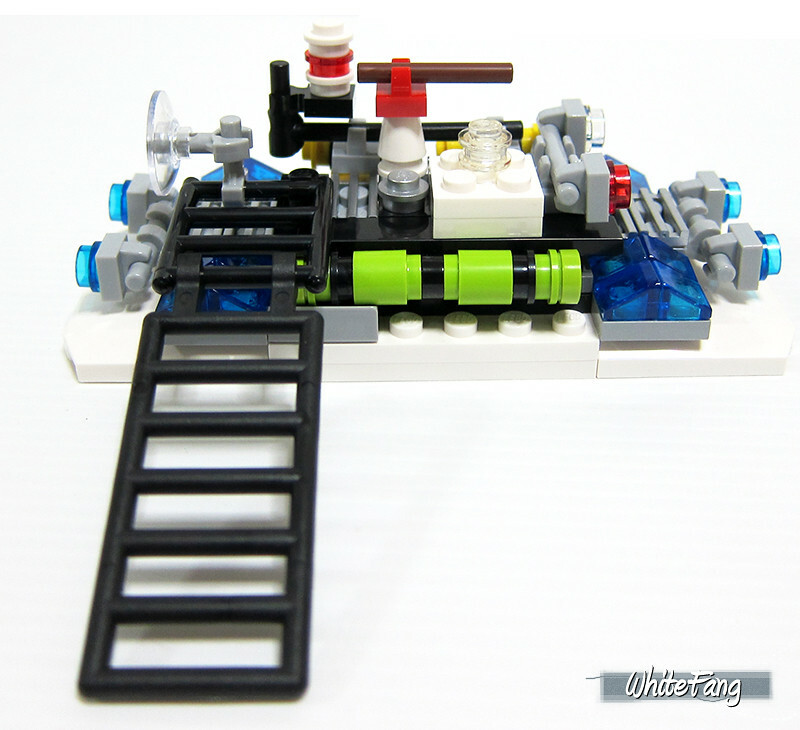 The whole idea proved to be successful in the LEGO and non-LEGO community with this simple formula and approach. Build an idea, share that idea of yours, gather support to reach 10,000 votes to qualify for the LEGO review panel. And, if it is successful, it will be produced as an official new LEGO Product under the LEGO IDEAS Theme. It's that simple, so if you have the aspiration, then read this link to find out the working mechanism. 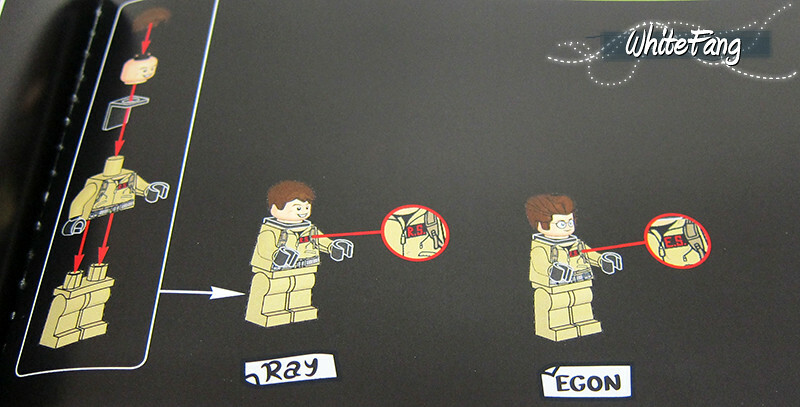 In conjunction, with the celebration of the 30th Anniversary of the Ghostbusters, TLG has decided to launch this LEGO IDEAS set on the 1st June 2014 to commemorate this celebration. Through Brent Waller's model, TLG designers' Marcos Bessa (Senior LEGO Model Designer) and Adam Corbally (LEGO Graphic Designer) took the lead to design this project and transform it into an actual LEGO qualified product. 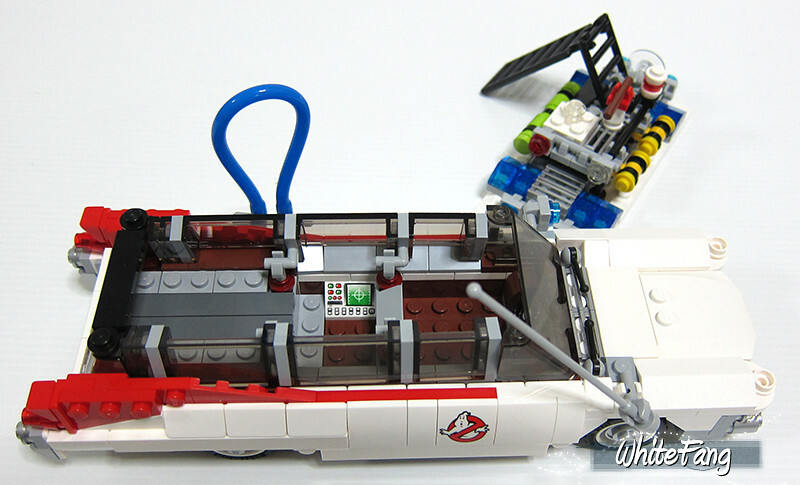 Marcos took care of the iconic Ecto-1 vehicle, while Adam took care of the design of the Ghostbusters' minifigures. I will have to admit that both have done a terrific job to bring this set to us. Of course, without Brent Waller's determination and perseverance, this can never be made possible and a reality. Within the sealed box, it comes with 6 mint packages and an instruction manual to build up the set. After the building is completed, these are the remaining spare parts inclusive of the orange brick separator. The instruction manual has a smooth finishing and it is very nice to touch and hold. It contain many interesting facts and information, such as the origin of Ghostbusters, Ecto-1 film development, nice Ghostbusters quotes from the characters and a word from the Model Designers which I enjoyed reading the most. My only complaint for this instruction manual. It is very brittle and the pages are easily torn off from the book spine, especially when I left it wide open on both ends and flipped the page after next during the building process, the pages just got off. Anyway, please be very careful with the instruction manual if you are intending to buy just only one set. The instruction manual highlights that each of the unique torso is specifically for individual characters. Don't mix them up wrongly and take your time to look at the torsos carefully. It is pretty fun and challenging to open all of the sealed packages and pour it into one building pool. Even though it increase the building time, it can be very fun to search for the elements for each step that you will encounter. Personally, the total piece count for this set is good for people who prefer to build through this approach. 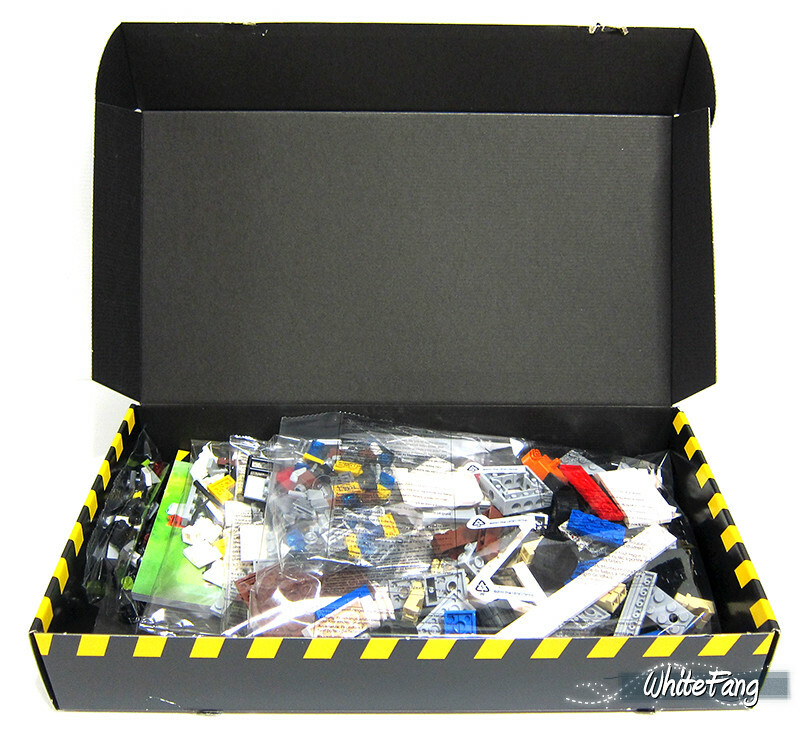 This set contain zero stickers and the above parts are printed bricks and tiles. It is always a wonderful treat when we are able to see nil stickers and able to enjoy the printed parts as it is. You get a total of 2 license plates for the front and back, 4 proton packs, 4 Ghostbusters' logos and a computer terminal. Please note that the computer terminal is not an exclusive printed part. It has been existed for a few years. Have a close look on the official minifigures' naming. 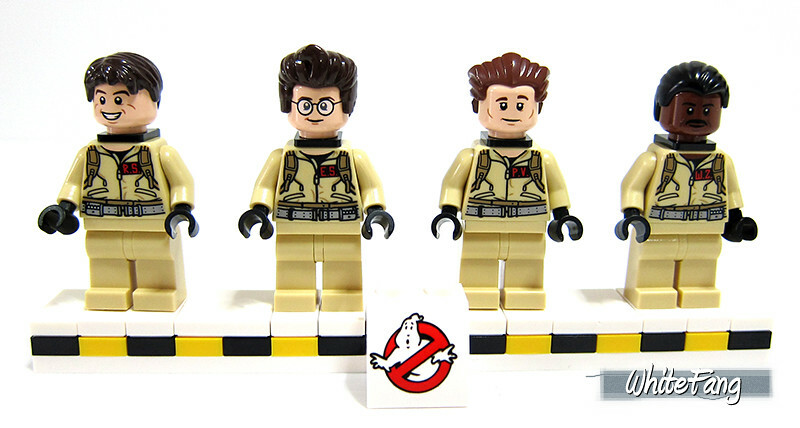 May I present to you from left to right, Ray Stantz, Egon Spengler, Peter Venkman and Winston Zeddemore. 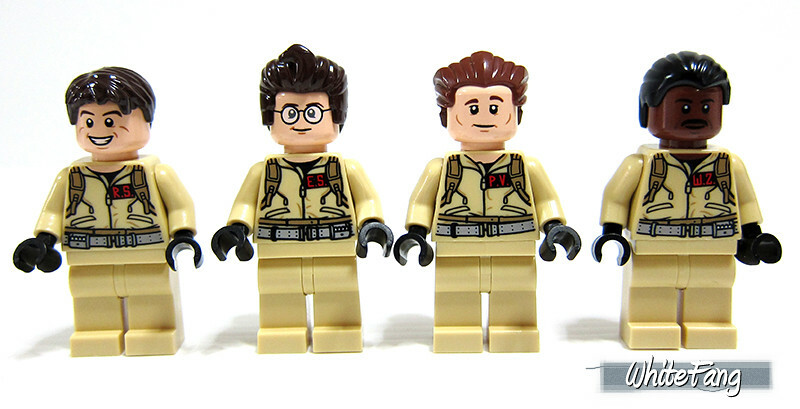 These Ghostbusters are now in official LEGO minifigures' sizing and khaki brown outfit. The minifigures' appearance are remarkable and impressive. It has nailed the details very well and it is very pleased to see that lots of attention is actually given to these minifigures. You will find more exciting details in the next few sections. I did not expect to see that their names to be spelt out at the back of their torso or uniform. In this way, if you aren't sure of their initials such as E.S or R.S, then flip to the back to find the right person for it. What's best, all of them received a different set of unique dual facials which shows their 'exciting' side of their work. This is just totally brilliant. 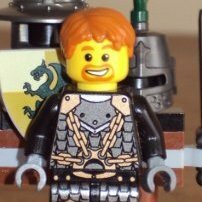 I could see these minifigures' heads to be found useful in minifigures' customisation. The brick built proton packs are very nicely done out and the printed part attached at the back is indeed welcoming. You can see the construction of the brick built proton packs through this image. The usage of the elastic whip is also useful to augment the aesthetics of the proton packs. 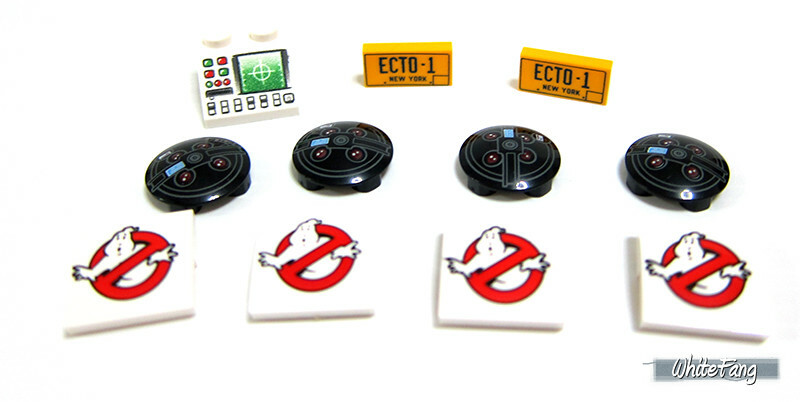 Not forget to mention that the ghost trap for the Ghostbusters is also part of their weapons assortment and the ghost trap is very vital to their ghostbusters operations. Aren't they look lively? You can see some good angles from the side view of the minifigure holding the proton pack and also the back view of the proton pack without the handle attached. The building of the minifigures display stand take place with the signature yellow and black to form the base of the stand. With a few bricks, jumpers and tiles added all in, the lovely Ghostbusters minifigures display stand is now completed. 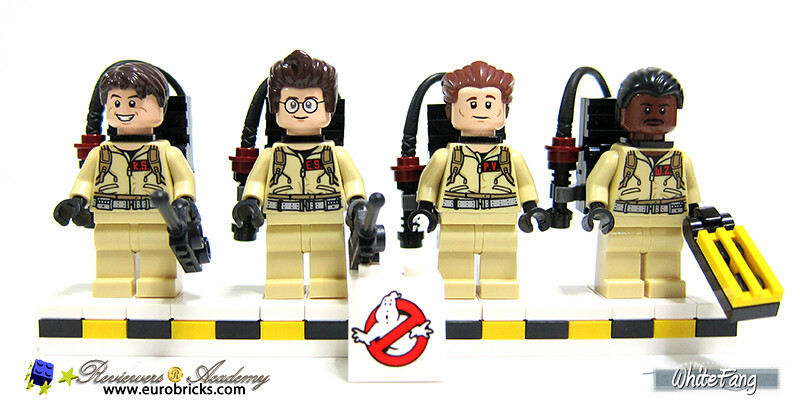 It definitely make a fine display piece to house the Ghostbusters minifigures at a single location. It is great that the designer has given some thoughts to do up this simple and yet effective display stand. 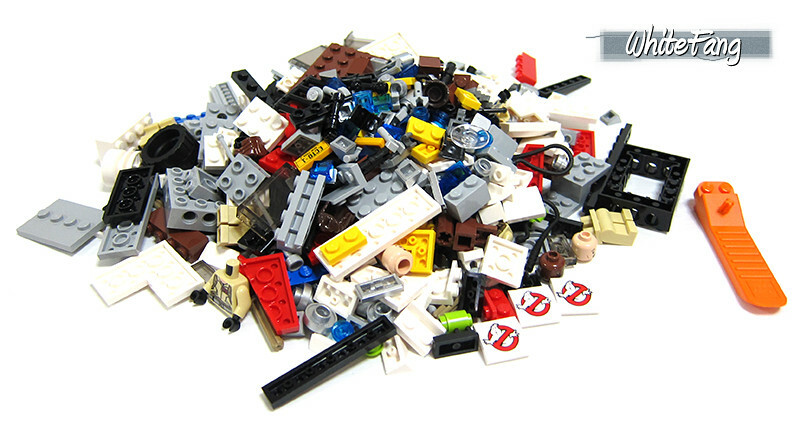 With everything on, this fully assembled minifigures image is an eye candy! I will love to have this placed on my office desk. The above 2 images show the basic illustration of the building process of the Ecto-1 which has certainly involved lots of advanced building techniques to form the basis of the car. When I was attending the Eurobricks Event 2014 in Billund, Marcos Bessa was sharing with us on the design process of this Ecto-1. His main challenge is to attempt to maintain the outer facade of the original model by Brent Waller, keeping the structure tight and firm by reinforcing the sides, to achieve the realistic look of a 1959 Cadillac professional chassis, similar to an ambulance/hearse combination and ultimately achieving the LEGO qualified product. It is no easy feat to be able to keep many factors in mind. As the targeted building age group is 10+, it means builders at the above the age of 10 should be able to handle advanced building techniques unlike the much younger builders. Great pity that I didn't take a photo with him earlier, but it is definitely great to hear him share his insightful thoughts. 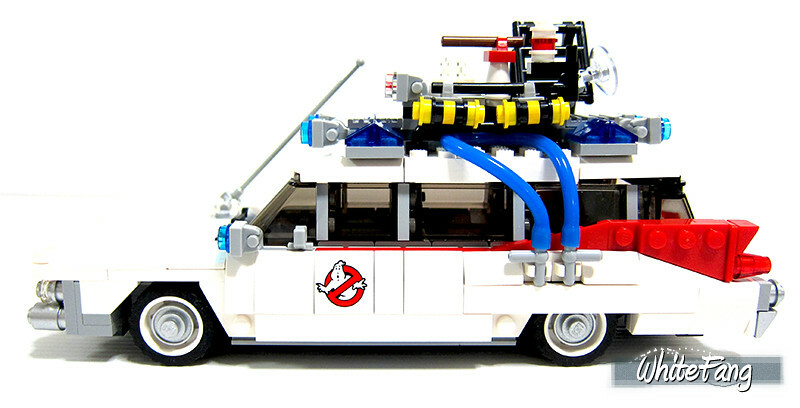 I really never understood why the Ecto-1's roof-top siren looks ever so complicated. It looks as if it is being stuffed with some hi-tech gadgets to track or monitor. But, in actual fact, it is just a special siren that emit a very special sound when it is on the move. I tried to find some references but to no avail. 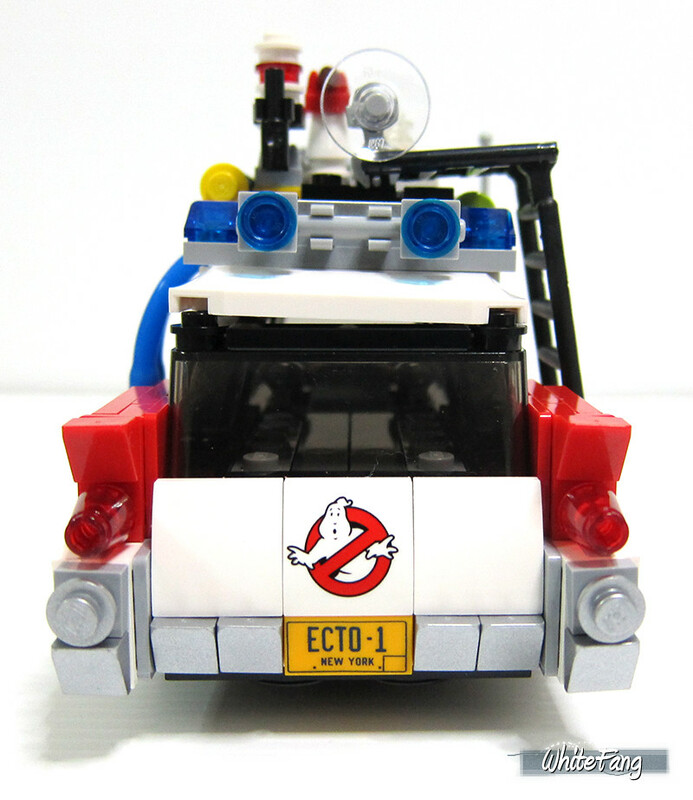 Any Ghostbusters enthusiasts could help to decipher the special meaning of the Ecto-1's vehicular roof-top? Just simply brilliant! From the top to the sides till the edges, the Ecto-1 is coated with very smooth and sleek finishing. 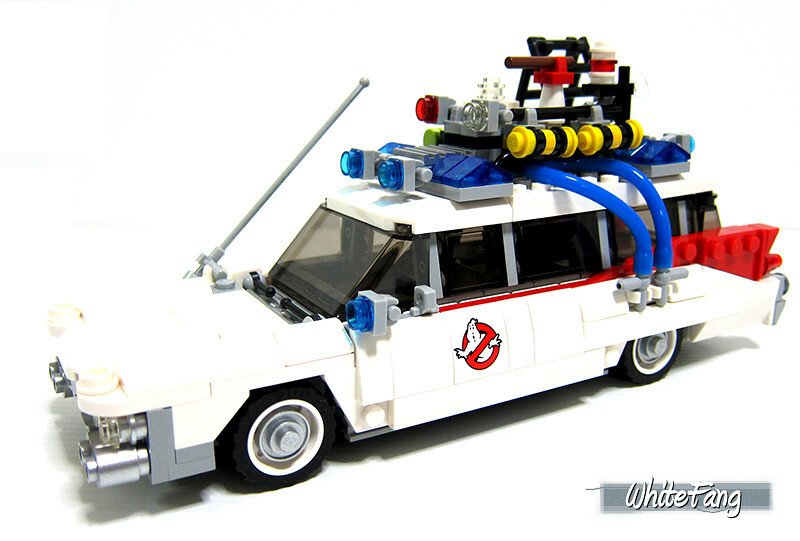 At one glance, you are able to identify and associate the built white vehicle is the iconic Ghostbusters' Ecto-1. The details are just plain amazing and it made me loss for words. The whole structure is firm and sturdy and I have positive building experience from the start to the end. Lots of amazing details ranging from the wheels, the back of the vehicle and the vehicular front. You are able to see the vehicular interior contain 3 main areas. The front is the driver seat. 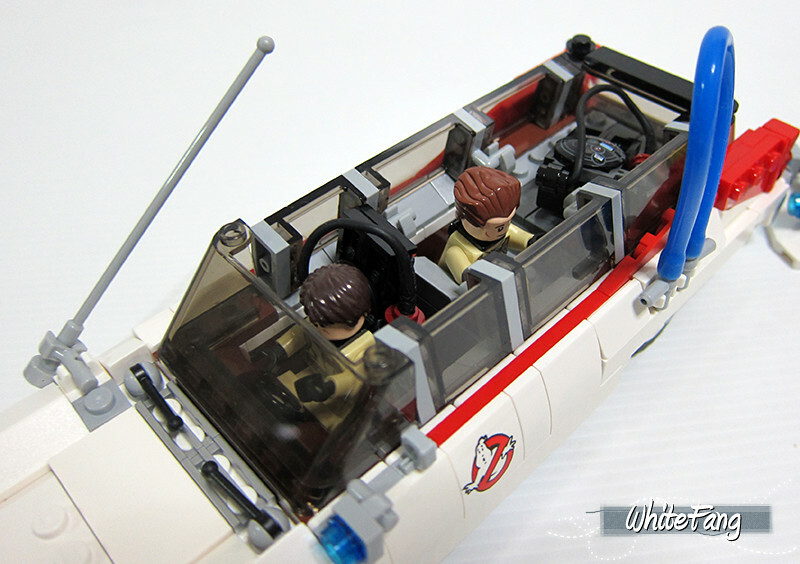 Even though the steering wheel is placed in the middle, with some modifications and adjustments, you should be able to be place 2 minifigures at the front without the proton packs. The middle section with the computer terminal could only allow me to place 1 minifigure and I can place the last one in there, if I remove the computer terminal. The rear will be the easy storage and retrieval area of the proton packs. It is not possible to place all 4 proton packs at the rear compartment. What are they doing within the vehicle? This is the optimum arrangement without any additional modification on my part. I wonder if you guys can fit the same way as I do? 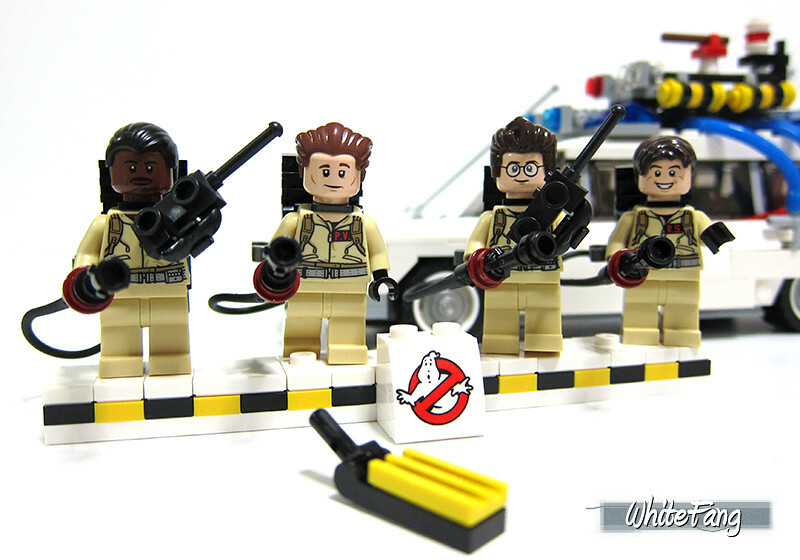 I am very pleased to share this very exclusive coverage of a special interview with our Eurobricks Member, WetWired or also better known as Brent Waller of this original creator of the Ghostbusters. The featured exclusive and very special 'Mr Rebrick' LEGO Minifigure is used as an intended minifigure for the interviewee. How do you feel now when your design is now part of the official LEGO product line? It feels great, it's literally a childhood dream come true, I used to fantasize as a kid about becoming a LEGO designer, and although I didn't design the final product it's as close as I'll likely ever get. 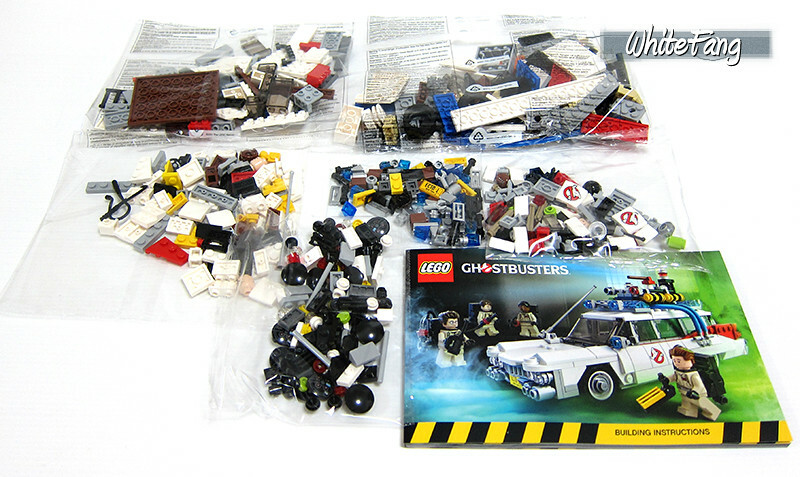 Not only that but as a huge fan of Ghostbusters it's a great honour to contribute to the legacy of the franchise by being responsible for the merger of 2 of my favourite things, LEGO and Ghostbusters. Why did you choose to make a Ghostbusters CUUSOO entry? I never had figures or anything like that as a kid, so whatever I was into I recreated with LEGO, the main 3 things being Batman, Teenage Mutant Ninja Turtles and Ghostbusters. LEGO had already officially released sets for the first 2 so I thought I'd take a stab at Ghostbusters for my local LUG, Brisbricks. 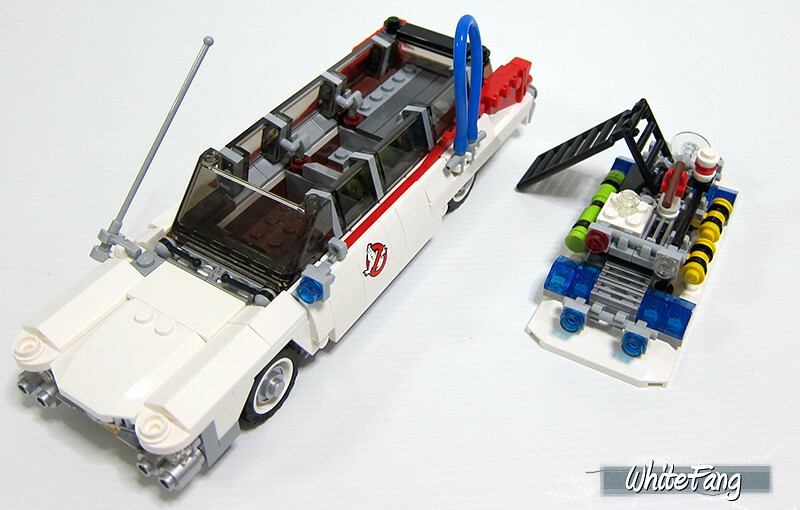 I initially created the Ghostbusters and Ecto-1 to display at their annual expo. It wasn't until a friend suggested I post it to CUUSOO that I even though about it. At the time my Batmobile Tumbler was doing reasonably well for votes but everything else I had posted was languishing so I didn't even consider it before that. Did you do something special for promoting your CUUSOO entry and making it reach 10.000 votes? There's so many things I could suggest, I've been thinking about doing a blog or video or something with tips on how to achieve 10000 votes, there's some many things. There's no magic rule to be honest though but there's a lot of small things you can do to help your project. I've found videos on YouTube showing off your project help immensely, they reach people who would otherwise not see or hear about your project, that's one of the big things you can do. On the other end of the spectrum, making sure your thumbnail image of your project is interesting and attracts people to click your project is a huge help, the biggest part of that is making sure when viewed as a small thumbnail, your picture isn't cropped or cutting off important text or parts of your creation. Care to share your new CUUSOO projects? I only just posted my follow up to Ghostbusters, The Stay Puft Marshmallow Man, I have a few ideas for future projects but I've also been trying to promote some of my non-licensed projects on CUUSOO as well, in particular my Modular Costume Store and ALA-N: Astronautical Lunar Android 9. They're both projects I uploaded when I first discovered CUUSOO that I'm still proud of, being unattached to a license though they're far more difficult to generate interest in. My hats off to Peter Reid and his Exosuit being the only project thus far that has reached 10000 votes and passed review, that's a huge achievement without a license or real world object behind it. What other potential LEGO Themes will you like to see as actual LEGO products? 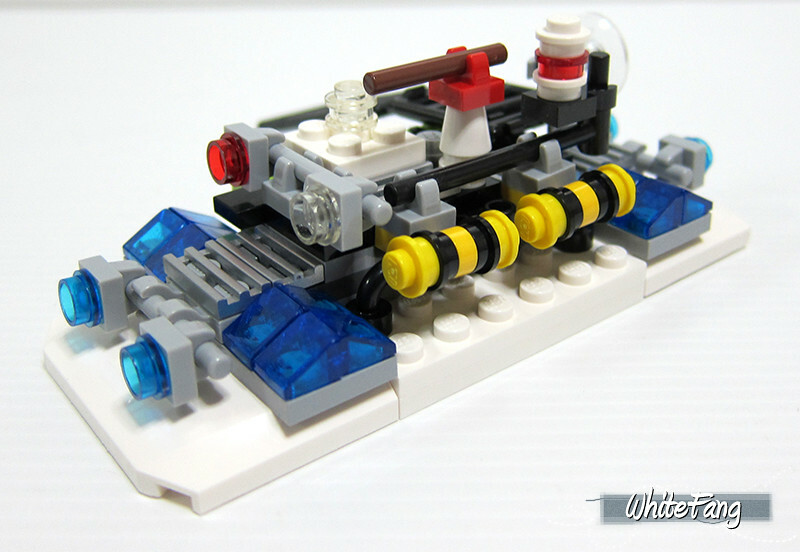 I'd love to see some classic space reborn stuff, I've dabbled in that area for MOCs myself. But in terms of licenses, there's not much left anymore, TLG are covering all their bases pretty well themselves with stuff like Batman, TMNT, Simpsons and niche products like Back to the Future and Ghostbusters. The inception of my own Batmobile Tumbler project came from my disappointment with LEGOs own official Tumbler at the time which was simplified and aimed for a younger audience, so I'd love to see a UCS Tumbler. I've got no idea why my own didn't pass review after reaching 10000 votes but my hope is that that they've got their own one in development, if it was complete with a Heath Ledger Joker Minifig and I'd be buy it in a heartbeat. Credits to Brent Waller for the usage of the original comparison pictures. Permission is given for these pictures to be used in this review. So, after viewing the comparison, there are some distinct differences, such as the side rear of the vehicles, overall length of the vehicles, lack of chrome parts, design of the bonnets, etc. Although I never had a chance to see Brent's actual model, I personally felt that the finished product is pretty impressive and up to mark. Shall we nab that ghost? Let's catch all of them! To conclude, I have nothing much to add for now. Alright, I have one small feedback though, and it is the exclusion of Slimer. I really wish somehow or another, that Slimer can be included to make this set more complete. However, I guess the focus is more on the Ghostbusters theme as on its own. With a price tag of USD$49.90, there are plentiful of treats to acquire this set with no regrets. 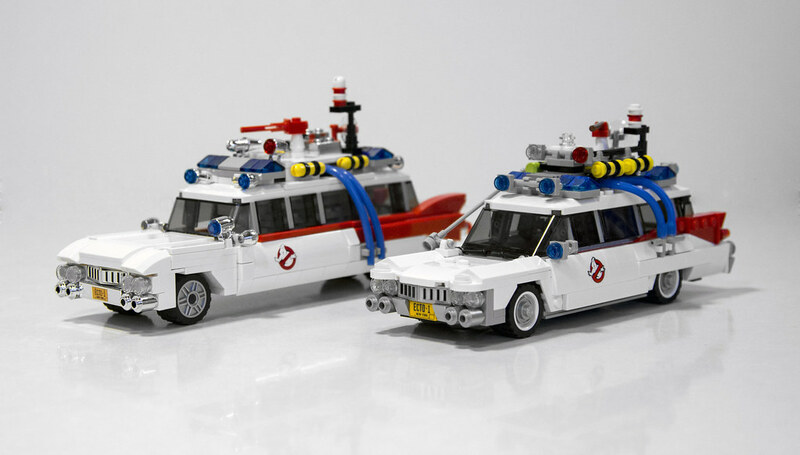 This set will definitely be popular among the LEGO Community and also to fans of Ghostbusters movies. It is certainly a great way to celebrate the 30th Anniversary with LEGO bricks. Love the film & will definitely get the set. 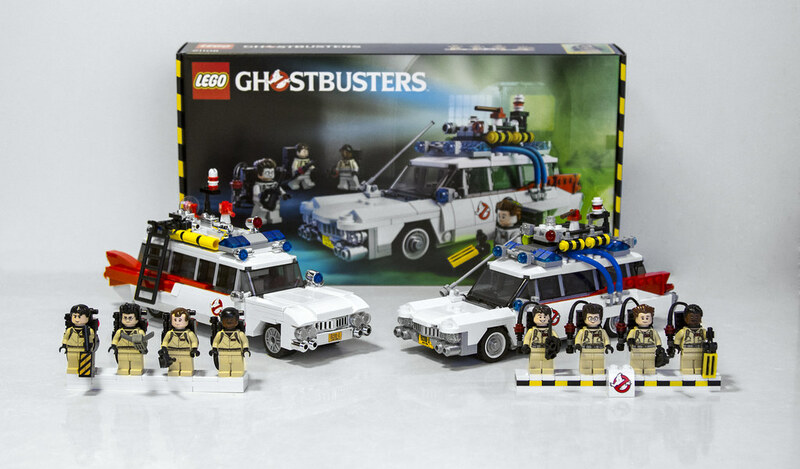 Bit disappointed that they didn't include a ghost of some description, even the standard monster fighters one would've done & they could've included a 1x2 tile for the trap instead of the yellow grille & could've included a pneumatic drill for Egon's hand scanner. They could also have included parts to create Ecto1A similar to what they did with the Delorean to create other film versions. AWESOME review of an AWESOME set 'Fangy', cool minifigs and Lego tried their best to copy the Cuusoo design within reason of price point. 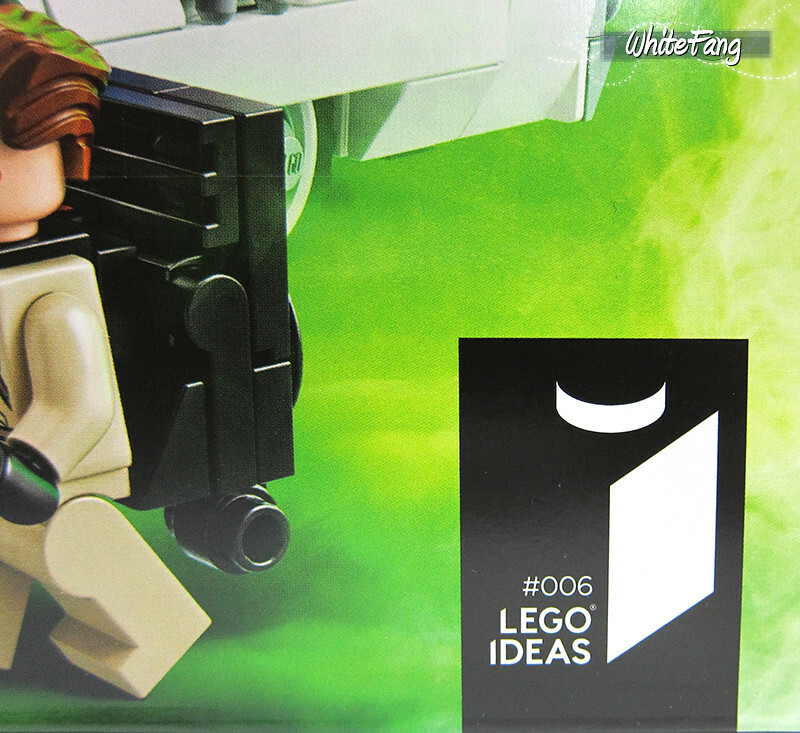 Interesting to see Lego Ideas on the box since it was only changed from Cuusoo not a month or so ago......me thinks it was the planned a long time ago to change it to Lego Ideas. By the way that printed computer screen 2x2 45deg slope is a few years old. Anyway thanks 'Fangy' for the review.......Brick On while not being afraid of ghosts ! Same sentiments too. Which is why, I dug out my old ghostly or horror look alike minifigures to play a small scene. I do agree that it will be nice if the trap come with a printed 1x2 tile. 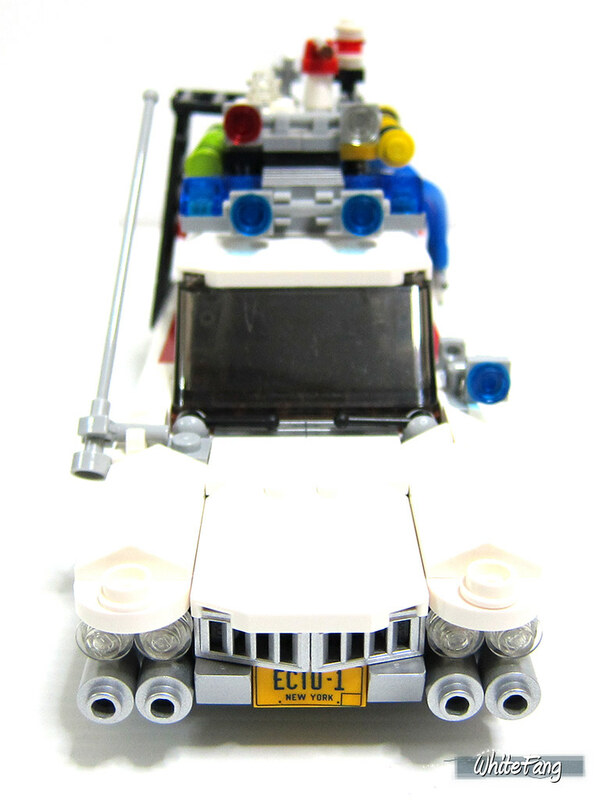 It is a nice idea to do some variations for Ecto-1A. It could be already planned to commence the transformation to take place altogether. Thanks for the great review WhiteFang! Thanks for the review. This is now the third review I've seen of this set and so far everyone has had issues with the instructions falling apart. Hopefully they get that fixed! The set is a must buy. I'd like to get it for Father's Day and I'll actually be near a LEGO store when this is released. But someone was saying it isn't released in shops until later this year, so I may be at a loss. Love this set. Much better than the DeLorean. Credits to WhiteFang and WetWired! Great review, WhiteFang! 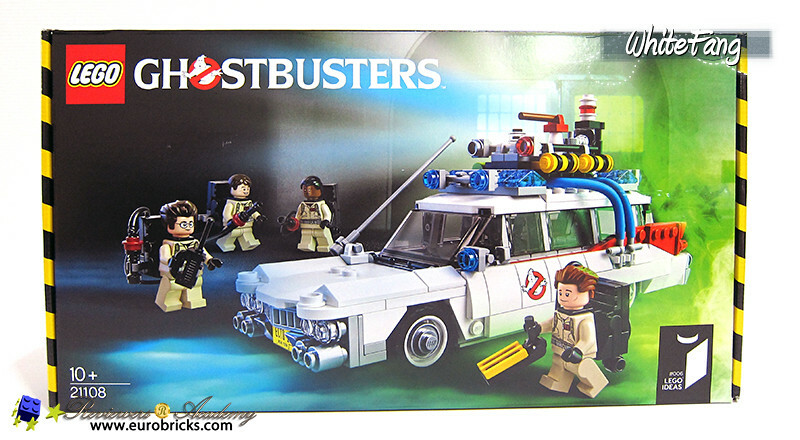 As much as I love this set It's going to have to wait a few months as I've exhausted my brick budget. I won't forget you, my dear Ecto! Probably the best set for the year for me. Although 'The Lonely Mountain' hasn't been shown yet. Hopefully I can score one on the official release. Time to BL some ghosts. Great review and thanks for including an interview w/ the creator. That was a nice touch! I rarely buy multiples of anything, but this set is THAT cool. 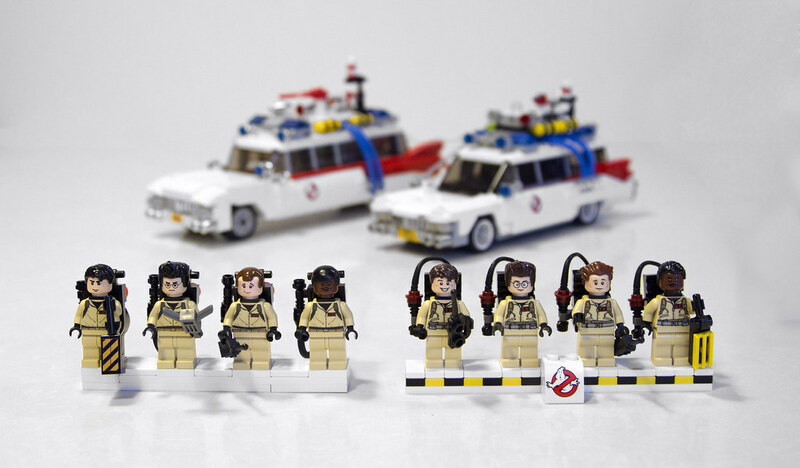 Only a little disappointed in the final build... Brent's original hood contour, red fins, and chrome details were nicer than the LEGO-approved version, and the original hair on Venkman was spot-on. Hopefully they'll invest in a new, balding hair pattern in the future that we can retrofit him with. Nice job to everyone involved in this project, including WhiteFang's great review! No stickers that's a good point! All in all - I think it is much better than the DeLorean! Thanks for the review! I find this is a great set and is currently number 1 on my buying list. The differences between the 'sketch' model and final model aren't huge but the other has a sleekness that the model doesn't quite have. Thanks for the review, this looks like a great set, I feel TLG improved on the minifigs and they did the car justice as well, I like the front hood and grill on TLG's version, but the tail fins on the old version along with the red line across under the windows. I also appreciate the old version's chrome items better. Really a combo of the two would make the perfect car. I do like the box on this one, similar to architecture boxes which I feel waste space a lot less. There just seems to be a ton of air in most set boxes that doesn't need to be there. Review wise, excellent, appreciate the insights and information you have given us. Top notch. I'm a little bit bummed that all four GBs do not fit inside...though I'm still buying this set the day it hits the shelves! Great review! I kinda like the set. ...they did the car justice as well, I like the front hood and grill on TLG's version, but the tail fins on the old version along with the red line across under the windows. I also appreciate the old version's chrome items better. Really a combo of the two would make the perfect car. 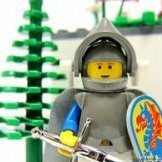 Also any insights on why LEGO doesn't simply use the original construction? That's the whole idea isn't it ? They don't need our instructions but if they want to encourage this why do they alter the designs ? 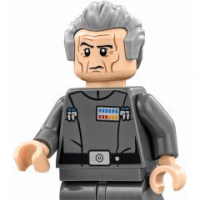 Also any insights on why LEGO doesn't simply use the original construction? They don't need our instructions but if they want to encourage this why do they alter the designs ? There are two good reasons I can think of: one is to create a more solid model that will stand up to play... the exosuit is a prime example of a MOC that looked great but fell apart too easily and needed to be tweaked. The second reason is to reduce cost... the chrome parts would come at a premium and don't hold up well to play so they were likely first to go, and sizing the car down slightly saved some bricks. I do love the idea of getting a digital download of the original to go with the official instructions though! This is a really great review, thanks for all the details and well-done pictures. Because of the relative cost of various elements, for ensuring that the building process is audience-appropriate, for ensuring 'legal' and playable connections, for producing a model that best represents the LEGO brand, and other reasons, but those are some major ones. I liked the BTTF set but this set is a childhood dream come true. I can't wait until I can get ahold of this one. Looking forward to seeing this one pull up to my MF Haunted House on the 1sy of June. Finally the ghosts around that house on the edge of my town will meet their match! Fantastic review, wonderful set! Hopefully I can get my hands on this. Photos seem to be a bit overexposed, causing some details to be lost. Nonetheless, thanks for the review. Looks like a cute set.